To answer your question, The Future Fire published 22 stories online in 2012 (including the 6 sample stories from Outlaw Bodies, which I don’t know if you’ve included in your reading). Glad you liked some of them, anyway, even if none made your top 19 for the whole year! Thanks to Clarkesworld listing all of their fiction for the year in their reader’s poll, I now know that the magazine published 36 stories this year. I liked 12, overall, which is 33%. Apex editor Lynne Thomas says that the magazine published 27 original stories and 13 reprints. Of the stories I favorited, 8 of them are originals and 1 is a reprint. Thus, I liked about 30% of Apex’s original fic. Lightspeed published 48 original stories (if this list of Hugo-eligible works is anything to go by) and I liked 13 of them. That’s about 27%. By my rough count, Strange Horizons published 32 original stories and I liked 11 of them. That’s about 34%. 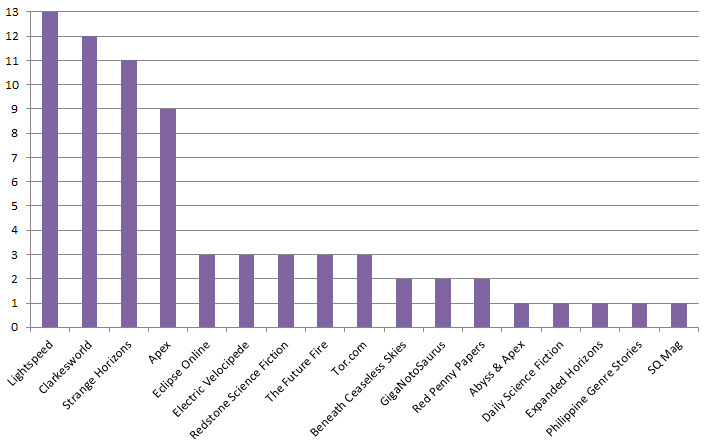 So, if you look at percentages, the magazines with original stories I like best are: Strange Horizons (34%), Clarkesworld (33%), Apex (30%), and Lightspeed (27%). 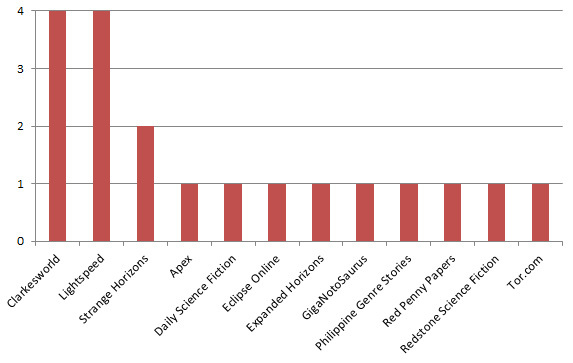 Yep, SH had 35 stories in 2012, of which 3 were reprints. Hmm. yes. Dunno why my data said otherwise. Possibly because I had the Yanez story accidentally marked as 2011 for a long time. Wow, I guess great minds think alike, because I had The Wisdom of Ants by Thoraiya Dyer and Astrophilia by Carrie Vaughn on my “Best Of” 2012 list. I’m a huge Ken Liu fan too, and my favorite work from him in 2012 was The Waves from the December 2012 edition of Asimov’s Science Fiction Magazine. I digest most of my short fiction as podcasts and am especially fond of both Clarkesworld and LightSpeed. I also like EscapePod as well for short audio fiction. Will be interesting to see what award season brings in 2013. Thanks much for sharing your list!